Gifting has never felt so good. Oh yes, and what really makes me happy is the fact that this is one of those few gifting options that supports a cause. In case you are one of the many individuals, who still hasn't picked up a Christmas Gift Kit for your loved one, head to The Body Shop store right now. They have got some amazing gift kits, packed in super cute boxes and wrappers, and each gift helps in providing clean water to people who are deprived of it. Want to know more? Read on. Christmas is a magical, happy time. But, that should be for everyone, right? Sadly, there are people who are deprived of basic necessities, like food, shelter and the most basic need - Water. While we keep wondering if we have had our water intake for the day, there are people who survive on just one pitcher for the entire family, that too, filled with dirty or muddy water. For over 650 million people across the world, access to safe water is not even possible and around 1,400 people die each day from diseases caused by dirty water and poor sanitation. This year, The Body Shop has partnered with WaterAid to help transform lives through access to safe water. For every specially selected gift bought at The Body Shop, WaterAid can provide a family in Ethiopia with one day of safe water. Currently, the store is filled with some amazing gift kits, right from skincare special to perfumes and even make up. While there are gift kits of popular collections like Strawberry and Fuji Green Tea, one can also take their pick from two new collections - Glazed Apple and Cranberry - that are available in cute travel friendly boxes. Packaging: Same as the big sized bottle and jar. The shower gel comes in a plastic bottle with a flip flap cap, while the body butter is housed neatly in a plastic jar. 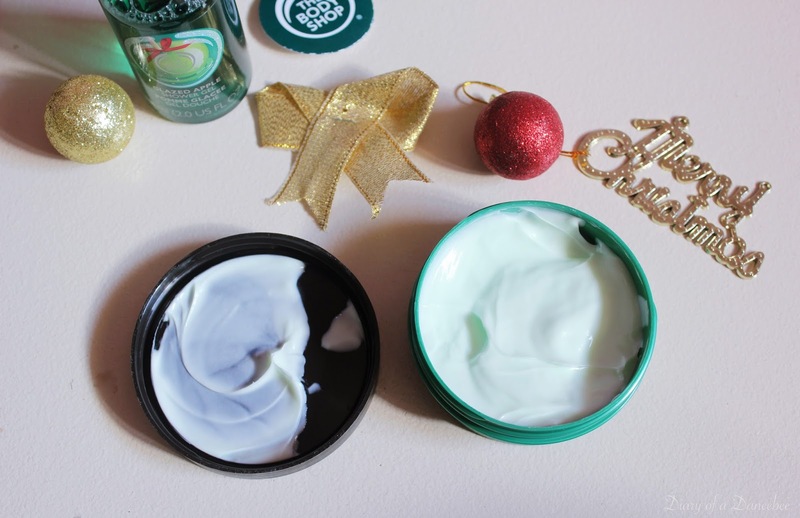 Texture: Glazed Apple body butter, just like others by The Body Shop, is soft, creamy and non-greasy. Glazed Apple shower gel forms a rich lather and post shower, leaves your skin feel supple and squeaky. Both the products are perfect for winter. Fragrance: It's a lot like sitting amidst a whole lot of apples! But, the fragrance of both the shower gel and body butter is nice and subtle, not too overpowering. We like how it's not too fruity. And yes, the fragrance of the body butter is addictive and very peculiar. Apply it once and those around you will definitely ask about the fragrance. 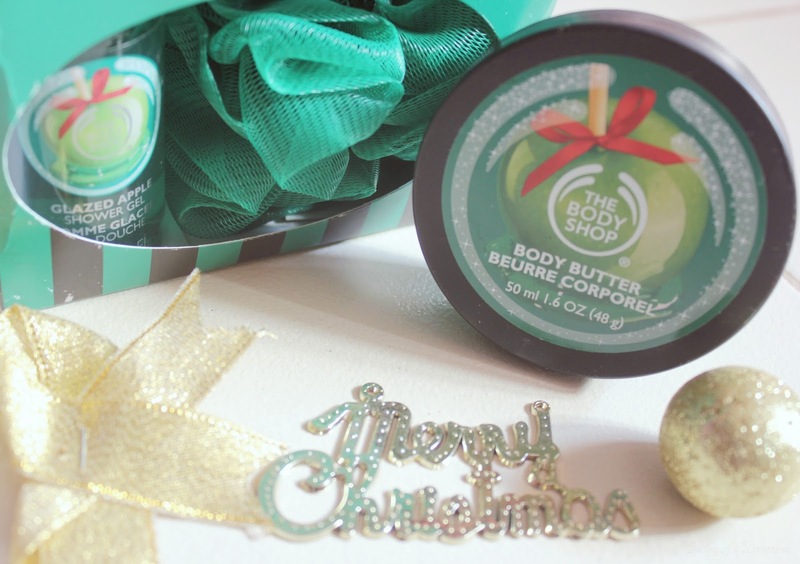 Verdict: The Body Shop gets yet another winner, this time in the form of their globally popular Christmas range - Glazed Apple. During winter, we have always sweared by their Shea range. 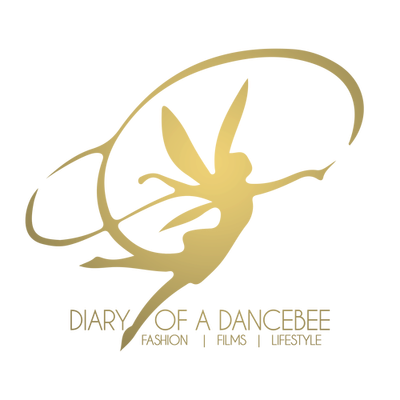 But this year, the brand has got us addicted to the delightful glazed apple collection. And the Christmas gift kits make for a win-win situation. It helps you pick some unique gifts for your loved ones, while making a family in Ethiopia smile this festive season.